It's time for our EGGcellent Easter Hunt once again! For seven days bright Easter eggs and adorable bunnies will play hide-and-seek on the Cetaphil websites! 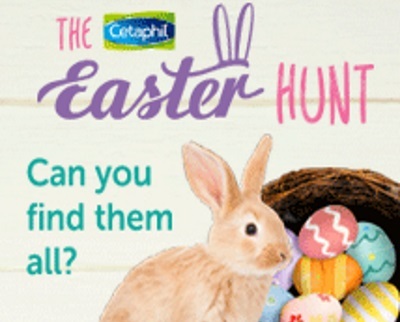 Visit Cetaphil and Cetaphilbaby every day from March 22 until March 28 to read the clue that will lead you to the hidden egg and a chance to win daily product giveaways. Contest ends Thursday, March 29, 2018, 9:59:59 a.m. EDT.